How sharply and clearly you see is known as visual acuity. 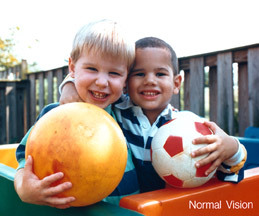 A child with 20/20 vision is said to have normal visual acuity – this means that at 20 feet away from an object, the child sees that object clearly and sharply. 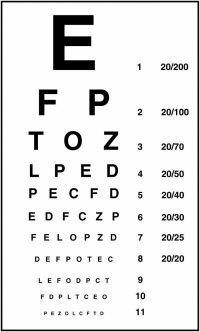 Most of us are familiar with the Snellen chart below which is what many optometrists use to check your visual acuity. New research shows that some adults who had hemispherectomy in childhood had reduced visual acuity in the eye opposite the removed hemisphere due to optic nerve atrophy or deterioration of the retinal ganglion layer in the eye. 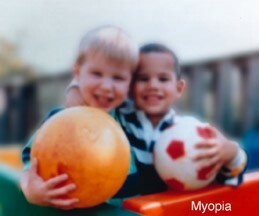 For this reason, children after surgery should be followed by an optometrist and have regular visual acuity assessments as loss of visual acuity can happen over time. This should include examination for farsightedness (hyperopia), loss of focusing ability (presbyopia), or nearsightedness (myopia) as well.